Who doesn't like OREO?? I think most of the kids who taste it will love it. The black coloured chocolatey taste cookies with white cream in it. 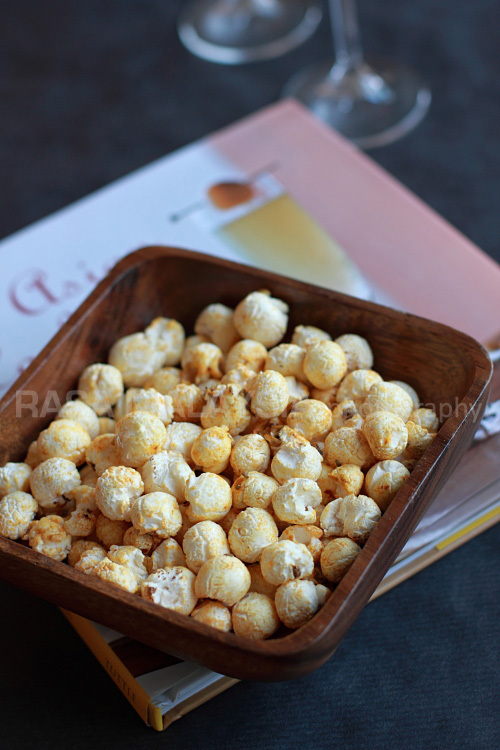 Crunchy and yummy!! 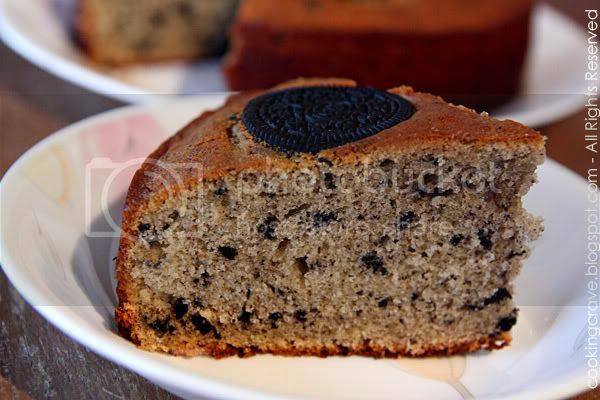 I came across this OREO Butter Cake recipe few months ago and straight away I bookmark it. 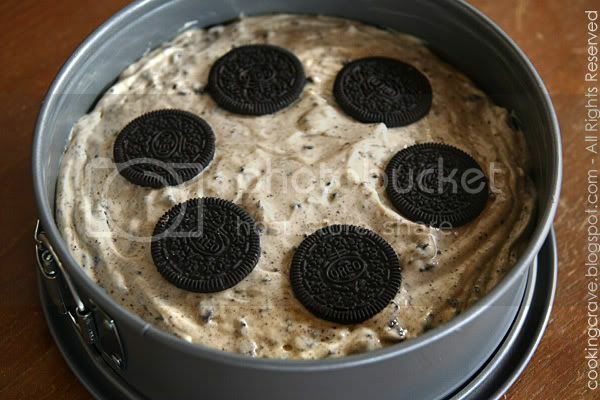 Ya, I'm going to bake this no matter how it taste because it use OREO as one of the main ingredients. Not only my kids love OREO but I'm also OREO craze. I love OREO and anything with it. One of my favourite are Oreo Vanilla Ice-cream ~ Yumm..yum!! The original recipe use 170g sugar but I reduce 10g and only use 160g, it taste just nice for me. The texture of the cake are soft and rather fine. I remove all the cream of the cookies and place it in a small bowl before I crushed them and beat the cream together with butter and sugar. My kids love it. 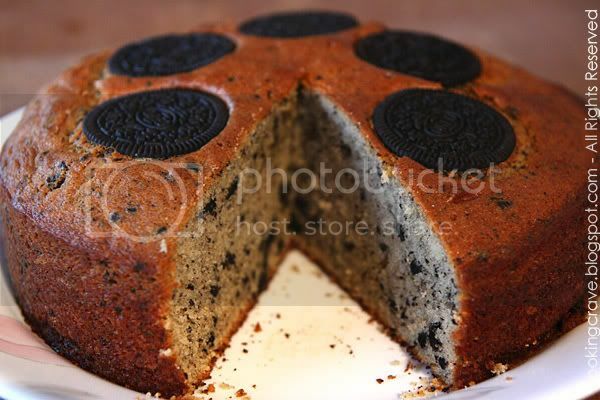 You can try this brand new OREO flavour butter cake once a while when we are getting boring with the normal butter cake. It's DELICIOUS, trust me!! Preheat oven to 180C and grease or line a 8-inch round cake pan. Sift cake flour, baking powder, baking soda and salt. Set aside. Cream butter, Oreo cookies cream and sugar till it's light and creamy. Add in eggs slowly. About 1 tbsp at a time and beating constantly for about 2 mins. Fold in gently 1/3 of the flour mixture until well combined. Follow by ½ of the yogurt and continue fold in 1/2 of the flour mixture, mix till well combined. Then followed by vanilla extract and fold in the the remaining yoghurt and finally the remaining flour. Lastly, add the crushed cookies and mix well. Pour the batter into greased pan and arrange whole Oreos on top. Bake for about 40 - 50 mins till skewer inserted comes out clean. Note: I bake this cake at 160c for 50mins. My oven tend to get too hot than normal one. 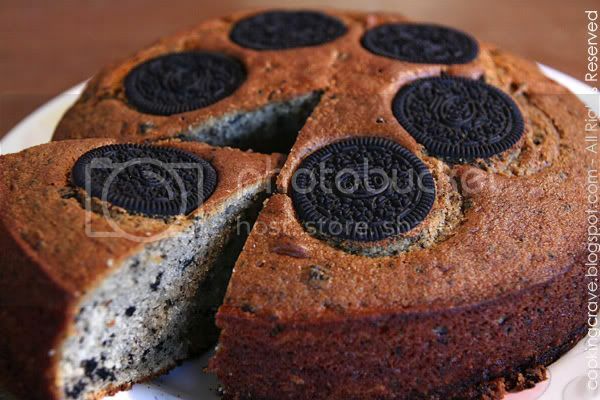 this Oreo Butter Cake look so nice n delicious!! I trust you this is delicious! Oreo, one of my favorite, with butter cake, another favorite! What's not to like! wah this one looks terrific!! i want to try! wow! wa, so many oreo fans around, i just finished 2 packs of oreo cookies! LOL! will bake this one next time! Thanks for sharing this special recipe, I sure will give a try soon. Too many good recipes out there, dont know which to try first, hahaha. My brother would LOVE this cake. I'll have to make it for his birthday. Hi, this cake looks good. May I know if the texture moist? It look so nice and I will try to make it in future, thanks for your recipe. I really wish to try out the recipe. But I am totally freak out in using my oven. I failed in controlling the temp and normally my cakes will get burnt on top before the cake is fully cooked. May I know how can I solve the above mentioned prob? And is it the cake suppose to be put in the middle rack of the oven for baking? My oven has the Power Selector switch, normally I will turn to upper and lower heating, is that correct?